The Short and the Sweet of It: Quotable. 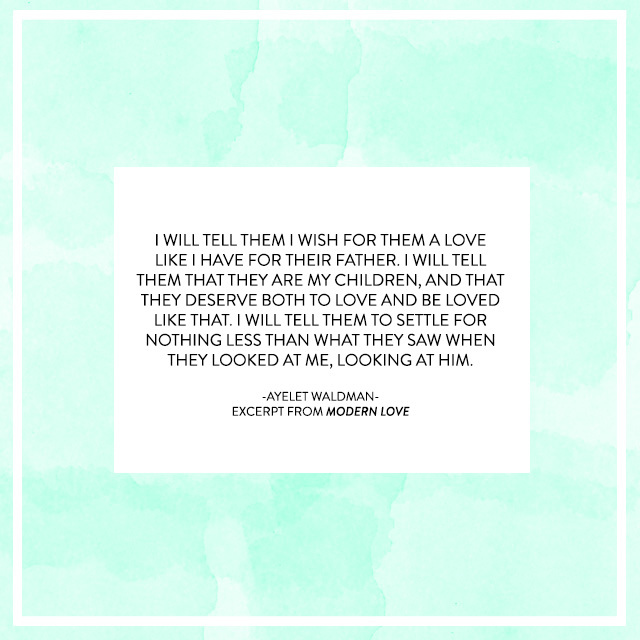 I'm currently reading Modern Love, by Daniel Jones, which is a compilation of stories about relationships: the ones that succeed, the ones that don't, and even some that are sort of on the blurred edges of both. It's a truly fascinating and super quick read if you're still looking for a summer book! The above quote, in particular, stood out to me. I often feel that lately my relationship with Matt revolves so much around our kids. It's a whirlwind of getting them up and dressed, feeding them, bathing them, reading to them, making sure Hop Hop the bunny is in his designated spot at bedtime, sorting out doctor's appointments and the upcoming school year. The list is a long one. And at the end of it all, there's not much energy and love left to give. We have our ups and we have our downs, but in the end, he and I are the foundation of this crazy little chaotic world that we call our family. And truly, one of my greatest wishes is for each of my children to experience a great love during their own lifetime. It's not a gift that I can give them, but it's one that I hope they come to value as the greatest gift of all. Alexa that is so sweet, I really want to read this book now! Thanks for sharing such a wonderful quote, happy Wednesday! Beautiful quote, and definitely need to check the book out! Such a sweet post. The love that you and Matt have is a beautiful thing to be treasured. Amazing quote, I really want to read that book, thanks for sharing! Such an absolutely beautiful sentiment–and an amazing team the two of you make!